How to deal with mechanical stresses and diffusion of heat that occurs in the bond line of this type of flooring ? *Hot water systems that conform to the NF DTU 65.14 specification. 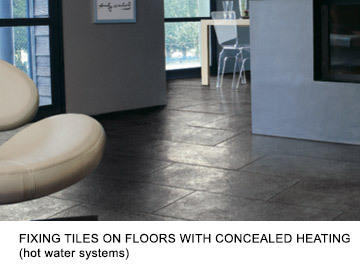 *Floors with in-built hot and cold water pipe that conform to the CPT specification 3164. If there is any micro-fissuring in the concrete substrate : use CERMIFACE bond breaking system. - Drying of embedding concrete: minimum 14 days. - Bring the system progressively up to its operating temperature over ± 10 days, 14 days after applying the concrete (please refer to the DTU Specification), in order to check its correct operation and the stability of the slab flooring. - Check that the concrete is in good condition. - Switch off the heating at least 2 days before laying the tiling. - CERMIFIX HP: please refer to the technical data sheet for suitable formats. - Use a U9 or E10 notched trawel, depending on the format. Please refer to the technical data sheet. - Peripheral joints: minimum 5mm. - Wait at least 24 hours after fixing the tiles before doing the jointing with CERMIJOINT COLOR, CERMIJOINT TX. However, we recommend using CERMIJOINT SOUPLE or CERMIJOINT TX admixed with CERMILATEX. - Renovation: see advice sheet n°41 and 42. - Water proofing: use CERMITANChE and CERMIPROOF. Wait at least 24 hours after fixing the tiles before doing the jointing.